A.J. Dallmayer delivers a pitch for the Washington C.H. 12-year-old all-stars in a Little League State tournament game against Wheelersburg Monday, July 17, 2017 in Maumee. Dallmayer hit two home runs for the all-stars in a 17-8 victory. Brayden Kettles stands on base after a hit for the Washington C.H. 12-year-old all-stars in their game at State against Wheelersburg Monday, July 17, 2017. 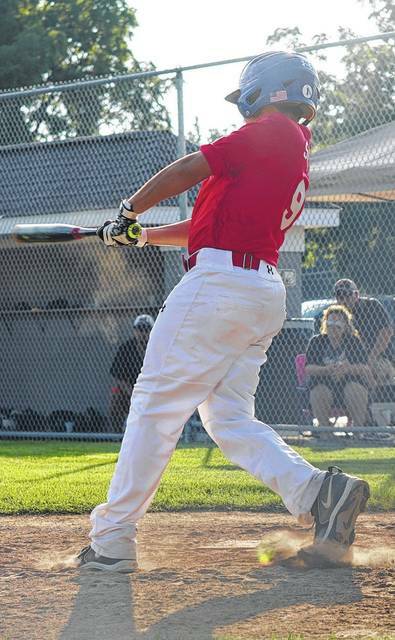 Bryson Sheets takes a swing for the Washington C.H. all-stars during their State tournament game against Wheelersburg Monday, July 17, 2017. Teammates gather to greet A.J. 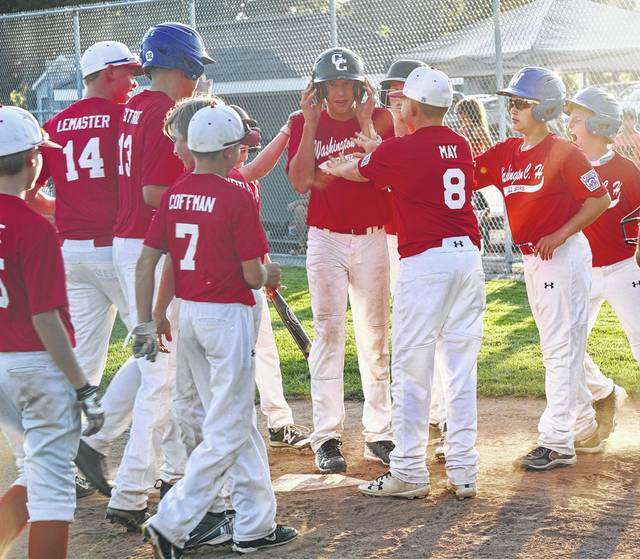 Dallmayer (center) after one of his two home runs during a State Little League tournament game against Wheelersburg Monday, July 17, 2017. Washington C.H. all-stars greet the all-star team from Wheelersburg after Washington beat them, 17-8 at the State Little League tournament Monday, July 17, 2017 in Maumee. 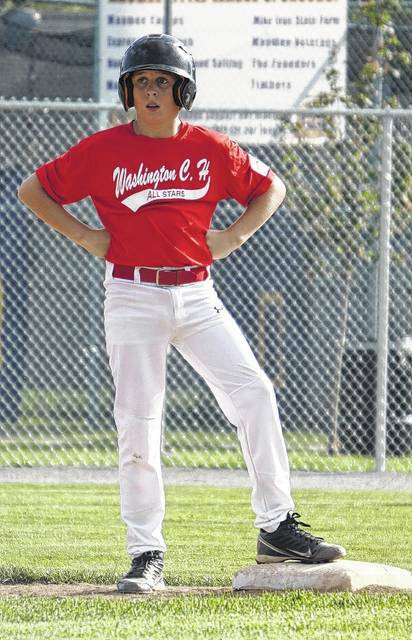 Washington C.H.’s Mason Coffman on base after drawing a walk during the State Little League tournament game against Wheelersburg Monday, July 17, 2017. MAUMEE — On Monday, July 17, the Washington C.H. 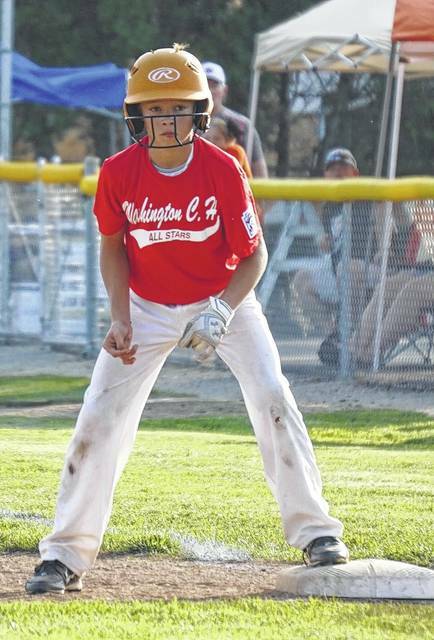 12-year-old all-stars faced a must-win game against Wheelersburg in the State Little League tournament. Washington rose to the occasion, posting a 17-8 victory. 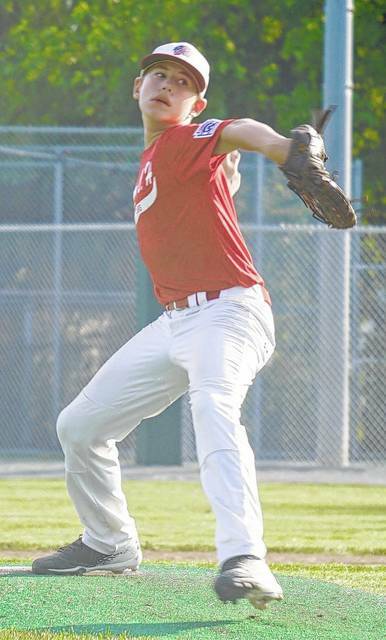 That win put the all-stars’ record at 2-1 with a game Tuesday afternoon against Dover. In the first inning, for Washington, John Wall hit a ball to the fence, but it was caught. Tyler Tackage walked and the next batter hit into a double play to end the first inning. Wheelersburg had a batter walk and reach second base in the first, but he was stranded. The score was 0-0 after one inning. A.J. Dallmayer hit a home run in the second inning to put the Washington C.H. all-stars on the board. Drew Guthrie and Brady Armstrong both walked and Brayden Kettles hit a double to make it 3-0, Washington. Wheelersburg tied the game with three runs in the second. Tackage hit a single and Jonah Waters singled in the third. Dallmayer hit a double to score Tackage to make it 4-3. Guthrie hit a double, scoring Dallmayer and Waters to give Washington a 6-3 lead. Kettles walked and Lemaster hit into a fielder’s choice to score Guthrie, making it a 7-3 ball game. For Wheelersburg in the bottom of the third, two hits, sandwiched around a hit batsman, made it a 7-4 score. At this juncture, Tackage was relieved on the mound by Dallmayer. Washington held a 7-5 lead after three complete. In the top of the fourth, Wall singled and Tackage hit a double, placing two in scoring position. Waters followed with a double that made it 9-5. Wheelersburg loaded the bases in the fourth and scored on a passed ball to pull to within three runs at 9-6. In the top of the fifth, Washington scored again. Wall walked and Tackage reached on an error. Waters hit a double to score Wall and Dallmayer smacked a double that scored Tackage and Waters. Guthrie hit a double that scored Dallmayer to lift Washington’s lead to 13-6. Armstrong kept it going with a single, scoring Guthrie for a 14-6 advantage. Wheelersburg scored one in the bottom of the fifth to put the score at 14-7. In the top of the sixth, Wall hit a single. Tackage singled and Dallmayer cracked his second home run of the game, giving the all-stars a 17-7 lead. The inning ended when Wheelersburg turned a double play. The ‘Burg rallied for one run in the bottom of the sixth, making the final score 17-8, Washington. The Washington C.H. 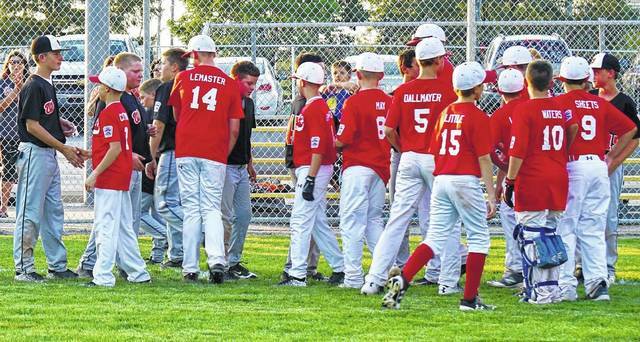 all-stars 12-year-old team saw their State Little League tournament run come to an end with an 8-1 loss to Dover Tuesday afternoon. Washington finishes the State tournament with a record of 2-2.